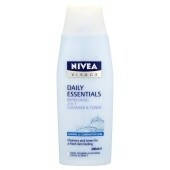 Nivea Visage Daily Essential Refreshing 2 in 1 Cleanser & Toner for Normal & Combination Skin. Cleanses and tones for a fresh skin feeling. - Removes daily impurities and make-up. - The 2 in 1 formula, cleanses and tones in one single step without leaving residues. Aqua, Alcohol Denat., Paraffinum Liquidum, Ceteareth-6, Decyl Oleate, Dimethicone, Glycerin, Nelumbium Speciosum Extract, Tocopheryl Acetate, Panthenol, Stearyl Alcohol, Xanthan Gum, Propylene Glycol, Sodium Lactate, Butylphenyl Methylpropional, Hydroxyisohexyl 3-Cyclohexene Carboxaldehyde, Geraniol, Limonene, Cinnamyl Alcohol, Alpha-Isomethyl Ionone, Hydroxycitronellal, Benzyl Salicylate, Linalool, Benzyl Benzoate, Citronellol, Eugenol, Benzyl Alcohol, Hexyl Cinnamal, Parfum. I love this product although I now use the nivea two in one cleanser toner from teh pure and naturals range. Lovely smell, consistency and easy to use, leaves the skin feeling soft and moisturised. I sometimes even went without moisturising after. Skin was cleansed and toned well, price is great and worked really well. I really enjoyed using this, my skin looked and felt great after use. Skin was nice and clear. Scent is really nice too. Felt nice and cool on the skin and make up came away wonderfully. I really like 2 in 1 cleansers and toner and i decided to give this one a try when i saw it on offer. the consistancy is good,not too runny and applies well. "I love this product although I now use the nivea two in one cleanser toner from teh pure and naturals range."